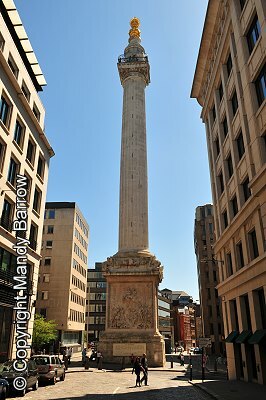 The Monument is a 61 metre (202 feet) tall stone Roman doric column in the heart of the City of London. It was designed by Sir Christopher Wren, and erected between 1671 and 1677, as the City's memorial to the Great Fire in 1666. The monument is the tallest single stone column in the world and contains a spiral staircase leading to a viewing platform from which you can see some remarkable views of the city. The fire began in a baker's house in Pudding Lane on Sunday 2nd September 1666 and finally extinguished on Wednesday 5th September, after destroying the greater part of the City. Why is The Monument 202 feet high? 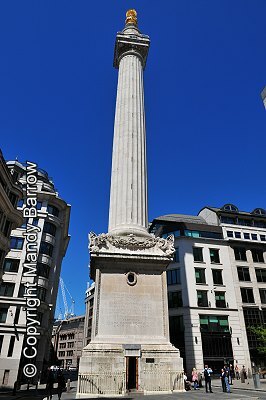 The Monument is 202 feet high, because it is 202 feet from the base to where the Great Fire of London started in 1666 (the King's baker’s shop, Thomas Farynor's in Pudding Lane). 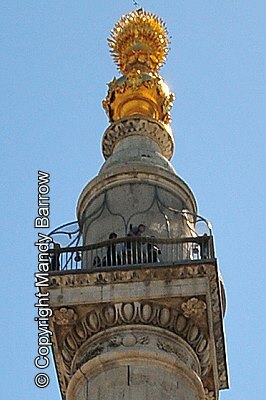 The top of the monument is reached by climbing up the narrow winding staircase of 311 steps. A cage was added in the mid-19th century at the top of the Monument to prevent people jumping off, after six people had committed suicide between 1788 and 1842. 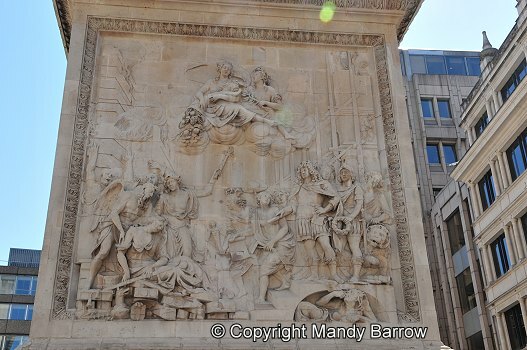 The west side of the base displays a sculpture, by Caius Gabriel Cibberith showing King Charles II, and his brother, James, the Duke of York (later James II) surrounded by Liberty, Architecture, and Science, giving directions for its restoration.